Economic efficient machines for the application of pressure sensitive materials only. Basic unit comprises top unwind, top rewind and bottom unwind (all with auto-locking of rolls). Single adjustment of aperture up to 5cms. with an LED colour-coded pressure indicator. Push-button controls for forward/stop/reverse and speed adjustment (up to 3.5M/min). Useful for pressure sensitive laminate application. 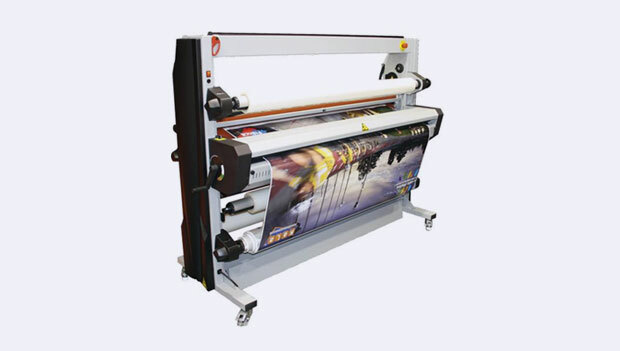 Small footprint with robust and innovative design; work can be processed sheet to roll or roll to roll as standard. The pivoting feed tray, with safety interlock, allows speedy roll changing. Additional safety features include laser eye protection at the nip and 2 emergency stops. The single chassis construction has additional roll storage and is on castors for ease of movement. Programmable control board also allows for individual speed (up to 6M/min), temperature (from 30º to 60ºC) and pressure adjustments. As above, but with a top roller temperature capacity up to 140º C, enabling the use of heat-activated laminates. Independent infra red heating enables the use hot and cold materials - simultaneously, if desired. All gauges of encapsulating film can be processed and most popular rigid substrates can be used due to the 5cm aperture possible.